It was a star-studded night. After recording her new song at Rotation Records, Amy Hosmer left the studio. She was greeted by about 75 enthusiastic fans. It was an eclectic bunch, ranging from toddlers to middle-aged men. Amy smiled shyly and thanked everyone for coming. Not what we’d expect from a rock star. Probably because Amy isn’t a typical star. Amy is similar to most little girls I know. She loves the color pink, Barbie, jewelry and makeup. She loves to perform and wants to be a professional singer. The 11-year-old receives a lot of attention, but she’s far from self-absorbed. After praying recently, she told her mom, “I always ask God to take away your pain if anything happens to me.”Amy prays for the people she loves, even when she has so many reasons to pray for herself. Amy has brain cancer. Her cancer was discovered when she was two-and-a-half. Early treatment reduced the size of Amy’s tumor so that it wasn’t life threatening. Since then Amy has had regular MRIs to check her health. Doctors recently discovered that the brain tumor was growing. On January 30, they operated and removed 80 percent of the tumor. Amy will be undergoing chemotherapy for the remaining tumor. You have so many hopes, dreams and plans for your kids. You think about what they’ll enjoy doing, what they’ll do in school, how they’ll react to a sibling. You even start thinking way down the line—about them getting married, what their kids will be like, and so on. Then, with news like this, you must suddenly be focused on two things – survival and doing all that you can for your child and the rest of your family. 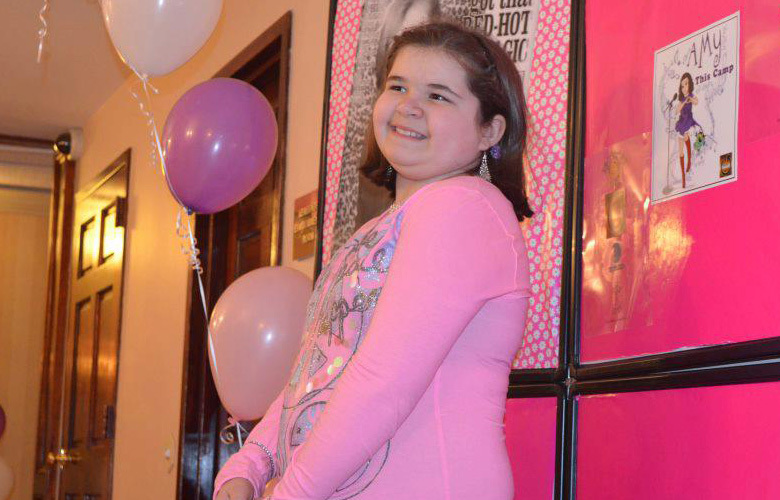 Amy told her mom, “If I had one wish, I’d wish to meet Taylor Swift and get hints on my singing.” Swift is Amy’s inspiration. Amy’s mom, Etta Hosmer, wanted to support her daughter, so she set up a Facebook fan page to try to help Amy meet Taylor Swift. When the executives of Rotation Records in Norristown, PA, heard about Amy, the offered her a contract to record a song in their studio. The recording was written and sung by Amy. Rotation Records added instrumental music on top of Amy’s singing and published her single, This Camp, on iTunes. Amy was “beyond thrilled” and practiced every day for weeks before her recording session. Taylor Swift sent Amy some gifts and an autographed photo, which were waiting at the recording studio. Of course, Amy also loved the after-party. Etta said that the Facebook fan page and the recording contract have been great for her family. Sue, a Ronald McDonald Camp counselor who took Amy shopping for clothes for her recording session. Two other camp counselors, Rosalie Hetrick and Maria Jacobs (who call themselves Hetchies Angels after Rosalie’s deceased husband who was always helping others) who organized the after-party. The friends, family members, and supporters at the red-carpet party and on Facebook. Amy’s classmate Katelyn and her mom Renee, who volunteered to get their hair cut to make Amy a wig. Some of Katelyn’s cousins are also donating their hair so there is enough for a full wig. Amy’s teacher, Sandy Hager, who held fundraisers for the family and got T-shirts that say “Supporting Amy” for the entire fifth grade. A photo of the class wearing the shirts was be enlarged for Amy’s hospital room. Amy’s family, who works so hard to support Amy and her younger brother and to make ends meet with such expensive medical care. Amy, who chose as her recording session song the one she wrote thanking her counselors at Ronald McDonald Camp. And you! Support Amy’s dream to meet Taylor Swift by liking her Facebook page and sending messages of support. It’s easy and fun and sure will make Amy feel great. You can also help defray her family’s medical costs by sending a donation to Amy Hosmer, c/o Merrill Lynch, 1650 Market Street, 29th Floor, Philadelphia, PA 19103.